PPF Chief Organiser and Coordinator Gamini Gunasekara handing the PPF policy papers to MP Gunawardena. 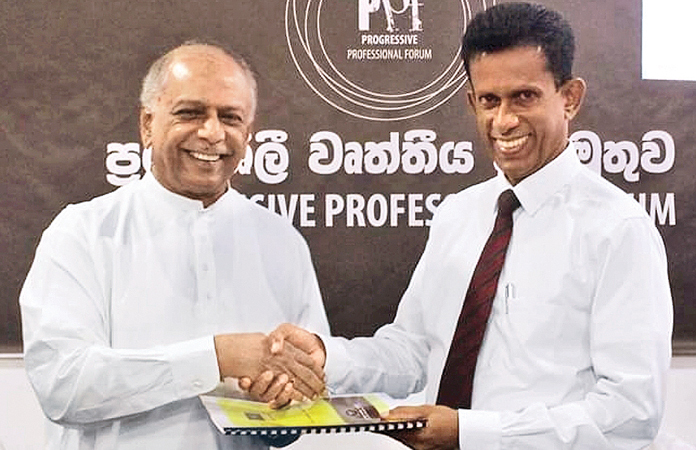 The Progressive Professional Forum (PPF) Seminar was held under the patronage of MP Dinesh Gunawardena, at the Sri Lanka Foundation Institute, recently. Senior Colombo University Professor H.D. Karunarathna was the keynote speaker, while Chartered Engineer Dr. Lionel Pinto also addressed the gathering at the event. Colombo University Professor D.M. Surathissa, Senior Colombo University Science Lecturer Dr. Sirimal Premakumara, former Westminster University visiting lecturer Rohan Perera, University of Technology Dean Dr. Sunil Kularathna, former Sri Lanka Telecommunications Regulatory Commission Director-General Aruna Amarasekara, former National Apprentice and Industrial Training Authority Director-General Jagath Basnayake, former Additional Sri Lanka Broadcasting Corporation Director-General Anura Fonseka, and Brigadier Sarath Wijesena were also present.